Michael Jackson may be gone, but he's not forgotten. 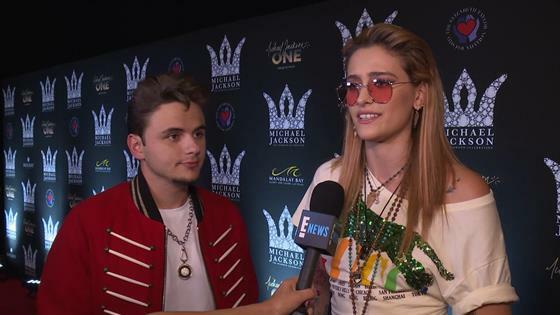 In celebration of what would have been the King of Pop's 60th birthday Wednesday, his son Prince Jackson, 21, and daughter Paris Jackson, 20, attended the Michael Jackson Diamond Birthday Celebration Evening at Las Vegas' Mandalay Bay Resort and Casino, hosted by his estate and Sony Music. E! News spoke exclusively to the famous siblings on the red carpet, where they shared fond memories of the "Beat It" singer, who died on June 25, 2009 at age 50. "We celebrate our father and his legacy in our own ways," said Paris, an aspiring singer. "It's really exciting to be here because this is just a celebration of love, and obviously today is very meaningful to so many people. I think we honor him every day. It's not so much the date; it's more just the feeling of it. But, there's a lot of love here tonight. I'm really excited about that." According to Prince, carrying out Michael's legacy is a privilege. "As my sister was saying, he led by example, and he obviously had a much larger platform than everyday people do have," he said. To honor Michael, the college student told E! News he set a goal to "help somebody else out" at least once a day, "even if it's a complete stranger." Supporting your local community isn't hard, he argued, and there is a lot "that doesn't require an extravagant amount of effort." There's no doubt in anyone's mind that Michael would be proud of who his kids have become. "I'm very excited to be here tonight," Prince told E! News. "I'm very honored that I'm able to be a part of something that's very groundbreaking—not just within the AIDS research, with Elizabeth Taylor AIDS Foundation, but also with the charitable contributions that my dad has made throughout the history of his life—as well as posthumously the way he set up his estate." The eldest Jackson sibling added, "I'm very proud and inspired." Two of Michael's brothers, Jackie Jackson and Tito Jackson, also hit the red carpet. Other celebrity guests who either admired or knew the "Thriller" singer included Angela Bassett, Vanessa Hudgens, Mark Ronson, Evan Ross, Ashlee Simpson-Ross, Gabrielle Union and Usher. Cirque Du Soleil also put on special performance of the show Michael Jackson ONE. For more exclusive stories from the Jackson siblings—and to learn about how they're continuing to support Michael's charity work—watch E! News tonight at 7 and 11, only on E!